Rules can be very vague or very specific. I have designed a Decision Tree to Help make wheel selection based on our current inventory. Be sure to have your rules handy! Be sure to scroll all the way to to the bottom. It will be a GREAT idea to purchase a few extra sets of wheels with your kit if you plan on going the DIY route. Please look over your info. Remember to save your good wheels, practice on the bad ones first. 7. The wheels supplied with the kit must be used. The wheels may not be cut, drilled, beveled or rounded. 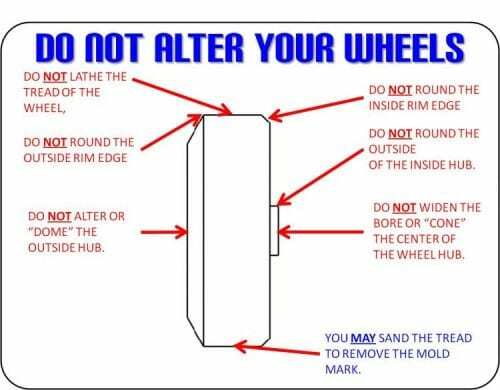 You may remove the seam from the wheels. From there the sky is the limit. This leaves many, many interpretations. The pic above is pack 502 rules. See how many different things they SPECIFICALLY address? Keep in mind that EACH pack has its own set of rules. You must use the wheels that come in your kit. Very few packs keep up with what wheels come with each box. There are 16 different mold numbers and every single mold and wheel can vary. The problem is not every wheel is near perfect. If you only get 1 good wheel, then the chances of the winners circle are greatly reduced. And you did nothing wrong! When buying wheels, be careful as to this rule. Getting 1 wheel out of 16 gives a 1/16 chance =.063 or 6%. Having all 4 wheels that are identical is almost as hard as winning the lottery. A good set of wheels is the utmost important for speed. Lighter wheels are faster. Round, true wheels are faster. The lighter the wheel the less rotational inertia and the faster your car can move. Because to do these modifications correctly, requires specialized tooling, if you are interested in this type of upgrade, please visit our online store. DERBY DUST DOES NOT ADVOCATE CHEATING OR BREAKING YOUR PACK’S RULES. YOU MUST DETERMINE WHAT YOU FEEL IS ALLOWED BY YOUR PACKS RULES. PLEASE DO NOT ASK US TO MAKE THIS JUDGMENT CALL FOR YOU. WE WILL DO OUR BEST TO TELL YOU UP FRONT WHAT WE THINK IS ALLOWED.